For the Japanese SG-1000 peripheral, see Handle Controller (SH-400). The Handle Controller (ハンドルコントローラ) is a peripheral for the Sega Master System (though is also compatible with the SG-1000 and Sega Mega Drive). It was designed primarily for racing games, with the D-Pad mapped to the steering mechanism and the and buttons being placed on top of each handle. It also contains turbo switches. Despite the overlay, the controller does not detect in-game values, so the visible numbers on the dashboard are purely decorative. When used on a Mega Drive, the two large buttons on the handles serve as and buttons, whereas the two smaller buttons on the left side of the base serve as the and buttons. 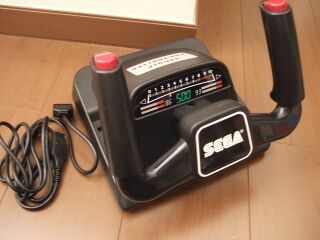 The Handle Controller was manufactured and distributed by Hori in Japan, but when brought to Europe it was given official Sega branding. The Hori version was sold primarily as a Famicom peripheral, with support for Sega platforms (specifically marketed for the Mega Drive) available as an option. This was made possible due to the fact that the device itself has a DA-15 port for detachable cords. The Hori version was bundled with the Famicom cord, while the DE-9-compatible cord (HJ-15C) was sold separately. The Sega version on the other hand was marketed strictly as a Master System peripheral without any mention of Mega Drive compatibility (which wasn't released in Europe at the time) and came bundled with the required DE-9 cord. Main article: Handle Controller/Magazine articles.